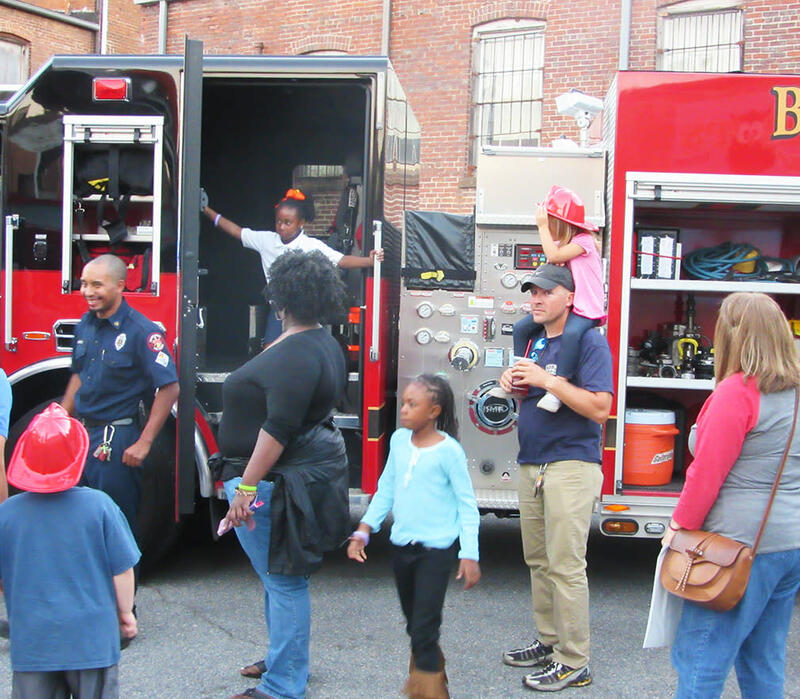 Milledgeville, GA – Milledgeville Main Street and Allied Arts have partnered for a First Friday Touch-A-Truck event and Party in the Plaza. On September 1st from 6-8 pm West McIntosh Street will be OPEN to pedestrians. There will be live music at the Black Heritage Plaza along with cars, trucks, and vehicles of all shapes and sizes lining the street for everyone to explore! Heavy equipment horns will sound, first responders’ lights will flash, and everyone will have a chance to satisfy their curiosity by getting up close to explore the vehicles. Including everything from fire trucks, a tractor, a helicopter, police cars, and “Milly” the Trolley, the only way to tour the town with the expert guides at the Convention & Visitor’s Bureau. Allied Arts will host the 120/80 Vocal Band, The Reception Band, and Marilyn Jarrette. The performance will begin at 5:30pm with the 120/80 Band and 7:30pm with The Reception Band and Marilyn Jarrette in the Black Heritage Plaza, next to the police station on West McIntosh Street. There is no admission for this event. The 120/80 Vocal Band plays multiple genres of music, including pop, rock, country, R & B, and more. The band’s stated mission is “to expose young people to music that they missed” and has been performing since 2001. The Reception Band and Marilyn Jarrette, who recently filled the house during the June 2nd First Friday event at Allen’s Market, will return to entertain again. The Reception Band members are Marilyn Jarrette, Kenny Waters, Stan Brown, and Carlos Toombs. The Reception Band performs a wide range of music, with a focus on the 70s, 80s, and 90s. Free face painting will be available by the talented Lisa Marie Barry to create custom designs. Magnolia State Bank and the City of Milledgeville FOG (Fats, Oils & Grease) Prevention representatives will offer hands-on engaging activities for children. There will be no shortage of fun! Shop, explore, and enjoy the first look at downtown Milledgeville&apos;s newest boutique! Firefly Boutique will be giving away coupons, a BEDSTU GIVEAWAY and so much more!! Hor d&apos;oeuvres will be served, 15% off coupons will be given to the FIRST 50 customers, and one lucky customer will win a free pair of Bedstu booties! Celebrate with them from 4-8pm and shop the exclusive brands. Join Eclectic this First Friday for a meet and greet with Artist Stephanie Scott from 4-7pm. See her love for detail in her original watercolors and etchings of landscapes and flowers. Milledgeville Main Street is always interested in featuring new, unique entertainment for the monthly, family-friendly First Friday event in downtown Milledgeville. For performing artists interested in being involved or for more information about First Friday, visit Milledgeville Main Street on the web at milledgevillemainstreet.com or contact the office at 478-414-4014 or mainstreetdesk@milledgevillega.us.